The Wall cycle is up providing some upside push. The 24TD cycle is also up providing some upside push (as well). 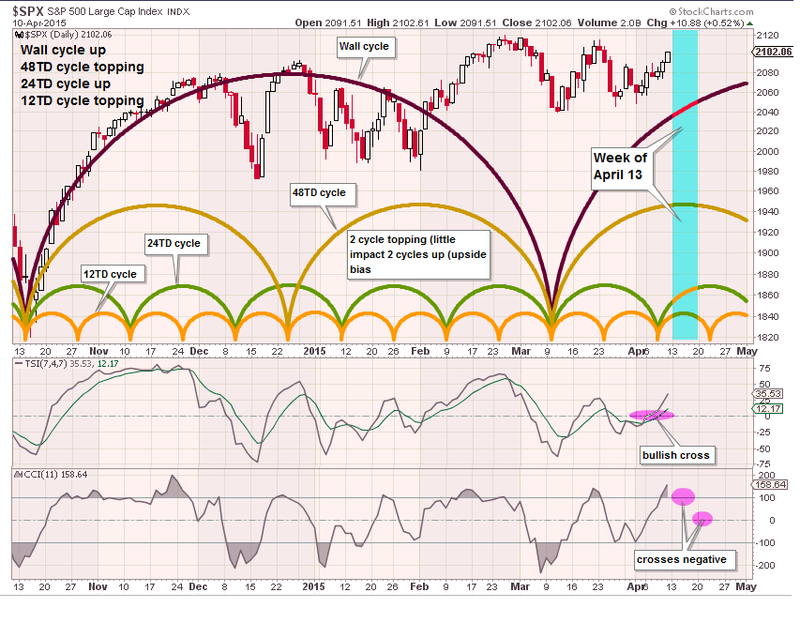 The 12TD cycle should top (upside push into mid week - then down). Potential of index highs mid-week. The 12TD cycle should turn down by end of the week. The remaining cycle will be topping during the week and provide little contribution up or down. 04/17 - futures looking weak prior to open, but you never know. Still, I had speculated that we would top mid-week and drift lower by end of week. Brad hasn't been right since he started posting in haven. Link not work.DO you expect new all time highs. NDX delayed in this move bid so possible spx little more higher 2110(+-2) Fractal suggest that we left 1 more leg down 2055(+-5) before push to all time highs 2145(+-5). NDX the same 4445(+-5) DAX 12585(+-10) TIme cycle can be use 2 forex too!!?? Nice work cheers!! Russell 2k -- new highs; S&P 400 new highs. Others like S&P 500, Dow within about 1/2% of highs.